Like many of you, I’m waiting for a miracle. Although I have seen God’s provision time and again, I have spent this week wavering. It’s not a fun place to be. As I prayed about what to share this week to encourage your faith—and mine!—I remembered all the times God has provided for us at Christmas. It has buoyed me and given me hope. I pray that it does the same for you. One year DH was unemployed, and we had no gifts for the kids. Out of the blue, I got a call offering me a chance to come and “shop” among donated items. Included were some of the things the girls wanted for Christmas. Another year we were having a rough time, and a neighbor (who knew nothing about our situation) came over with a black trash bag full of gifts for the kids. They specified that the gifts were to be from us, not them. We wrapped them, put them under the tree, and told the girls that God had provided them. One Saturday morning in December, we woke up and found a wicker laundry basket on our carport. There was no indication where it came from, but in it were various gifts and an envelope with money that helped pay bills and buy a few extras for Christmas! These are just a few of the experiences we have had at Christmas. God has been so very good to us, and I know He is already at work on our behalf on the things that concern us now. He’s doing the same for you! How have you seen God at work in your Christmas celebrations? 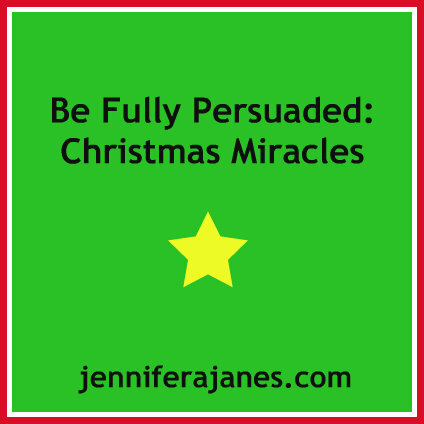 This entry was posted in Be Fully Persuaded, Christmas, Faith, Growth, Reflections and tagged Be Fully Persuaded, Christmas, encouragement, faith, personal growth. Bookmark the permalink. Praying that because of your act of sacrificial praise, someone’s faltering faith will be strengthened. I am also praying that God will again honor your trust and provide and give you another story of faithfulness. Thank you for offering beautiful evidence of God caring for our needs while demonstrating His awe-inspiring power. No prayer too small, no need insignificant. That’s a fact, Jennifer! He is so good! Oh, I love testimonies like these. It gives me goosebumps. God is so good, He sees all of our needs…even in the “little” things. Thank you for this series, Jennifer. These posts make my heart fill with joy. I’m glad that the testimonies are speaking encouragement and hope to your heart, Heather. Thanks for rejoicing along with me! I love the way God is answering your prayers – even when you are not praying. Though, he does know our needs and cares about our wants. He loves you sweet sister and I love seeing you shout to the world about his love! Yes, He answers even the prayers I don’t dare to pray. His love never ceases to amaze me. I’m a sucker for Christmas miracle stories. A few years ago one of my friends was dying of cancer, and we were all really struggling with it. He was one of my best friends, and his wife is my best friend. At our small group Christmas party it was like he suddenly was better for that night, and enjoyed Christmas with us. Then he was able to go to the Christmas Eve service, it was such an amazing gift from God that year. That’s wonderful, Ticia! What a gift!